Most companies who successfully outsource plastic injection mold tooling to China have been doing it for many years and have dealt with dozens of issues at one time or another. I would suggest asking for a recommendation from someone you trust who has this experience. Also, if you have a product that needs patent protection be sure to have an international patent in place before releasing data. I have outsourced plastic injection molding tooling built in China for years, the best source I have found is "Aco Mold" located in Shenzhen China. They have 2 manufacturing facilities in China. Go to their web site and you will see they have it all covered. I've spent many hundreds of thousands of dollars for plastic injection mold tooling with them and had great success. Their standard shipping (sea) customs charges and freight to your dock is included in the quote and standard ship time is 30 days, plus most if not all engineering charges are free. Lastly you don't have to deal with the language barrier, you dealing with the engineers with perfect English. Also you have to pay for molded sample shipping, but that is understandable. You can even get video of samplings. One last, all plastic injection molds are built with German tool steel and DME components or their equivalent all easy to get here in the United States. Like always send RFQ with material data, Part CAD data and shrink rate, specify machine size(s), cycle time, and go over their suggested injection mold design completely. Request Grant chart updates. You can go to their China mold manufacturing facilities if you want a field trip but I never did. We have been sourcing plastic injection molds from the China region now for several years. Although it requires good management control, the total cost reduction is substantial. 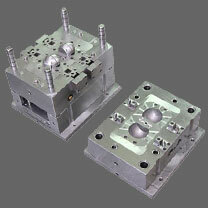 We are more than satisfied with our current injection mold suppliers in China. But if you start outsourcing like this you have to be prepared for heavy personal time investment and expect the worst!